Red Faction: Guerrilla, from Volition, Inc., is mayhem incarnate. It's an open-world action game set on the terraformed surface of Mars, gloriously structured around charging at cops with a sledgehammer and turning them into gargling piles of riot gear. You can launch your truck from a Martian dune, lodge it in the side of a huge smokestack, cover it in winking mines and blow it all to hell as you make a death-defying leap to the ground. There's just one niggling issue: Bullets can kill you. That's the way it is in most games, but Guerrilla isn't most games. It allows - even encourages - the systematic destruction of entire city blocks' worth of buildings with little more than your hammer and some C4. To have that end with the crunch of your bones and a sluggish Game Over screen is an injustice on par with the wholesale exploitation of an entire colony's worth of Martian miners. Unfortunately, those are The Rules. You can't jump that far. You can't survive that fall. Thanks, Volition, for pointing out that our protagonist has limits and vulnerabilities. Not that I'm ungrateful or anything, but I was pretty sure you couldn't smash through three feet of concrete with a meter of steel, either. Or kill hundreds of people without ever stopping for a hot meal. Or foster a fair, free society by leveling buildings and flattening cops. 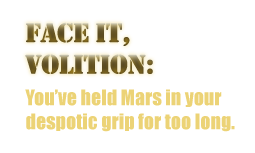 Face it, Volition: You've held Mars in your despotic grip for too long. We gamers refuse to toil under the oppression of the Health Bar. We will throw off the shackles of limited ammo. We will reclaim the means of instantaneous travel. We will fight you with difficulty levels; we will fight you with walk-throughs; we will fight you in the config files; we will fight you with hacks and glitches, exploits and trainers. And we will never surrender. Certainly, there are times when games should be enjoyed and judged in the manner their creators intended. But no matter how thoroughly you might enjoy Niko Bellic's struggle against his psychopathic tendencies in your first play through of Grand Theft Auto 4, you don't return to Liberty City to have a quiet stroll or go clothes shopping - you go there to drive cars into helicopters, to see how many times you can bump into people before they snap, and if you're in a particularly dark mood, to blaze a widening trail of cops from one bloody end of the city to the other. Sometimes you have a taste for character and story, for fairness and progression. Other times, you just want chaos.